Heat dressing in large nonstick skillet on medium heat. Add zucchini and 1-1/2 cups tomatoes; cook 3 min. or until zucchini is crisp-tender, stirring frequently. Add seasonings; cook and stir 1 min. Stir in beans; simmer on medium-low heat 5 min. or until heated through, stirring occasionally. (Add up to 1/4 cup water if needed to prevent mixture from drying out.) Stir in half the cilantro. Sprinkle half the cheese evenly onto tortillas; top with bean mixture and remaining cheese. Fold tortillas in half. Wipe skillet clean with paper towels. Add 2 quesadillas to skillet; cook on medium-high heat 2 min. on each side or until quesadillas are golden brown on both sides and cheese is melted. Repeat with remaining quesadillas. Combine avocados, lime juice, remaining tomatoes and cilantro. Cut quesadillas into wedges; serve topped with avocado mixture. For a touch of heat, add 1 chopped seeded jalapeño pepper to dressing in skillet along with the zucchini and tomatoes. Or, serve quesadillas with your favourite hot pepper sauce. Prepare using Kraft Double Cheddar Light Shredded Cheese or Cracker Barrel Shredded Light Mozza-Cheddar Cheese. Place cooked tortillas on baking sheet; place in 200ºF oven to keep warm until ready to serve. 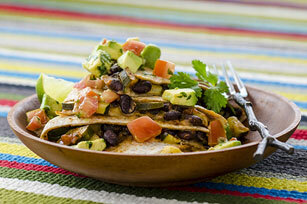 The cheese and beans in these great-tasting quesadillas team up to provide a good source of calcium.